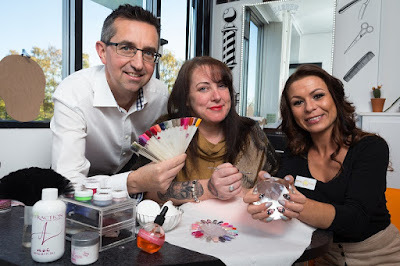 A Rotherham-based luxury hair and beauty salon, Beautan, has launched since receiving £500 funding from UK Steel Enterprise (UKSE) Kickstart Fund. Driven by demand from those looking to transform their appearance, Rebecca Duffy and Victoria Gale - the team behind Beautan in Maltby – have invested in vital marketing collateral and staff uniforms, thanks to the £500 funding from UKSE. Established in June 2017, Beautan is a prime, luxury beauty and tanning salon offering an array of treatments such as spray-tanning, hair removal, gel and acrylic nails, and haircuts, blow-dries and colouring. Rebecca Duffy, a qualified makeup artist and co-owner, saw a surge in bookings leading up to the Christmas period. Due to the increase in demand, the duo already have growth plans to expand their team to four, allowing them to accept more appointments and increase turnover. Victoria Gale, co-owner of Beautan (pictured, right), said: "I believe that the success of Beautan so far stems from the wide range of services that we offer. Often, people come to us for a haircut, realise we do nails and tanning too and leave having had the full works! "The UKSE funding has enabled us to pursue a passion, and we're both very grateful for the support we have received. We'd love to expand in the future and Rebecca is currently completing a barbering course, something else that we'll be able to add to our services allowing us to open the door to a wider range of clientele." UK Steel Enterprise, a subsidiary of Tata Steel, was launched in 1975 to support the economic development of steel industry areas. Launched in February 2016 by UKSE, with support from RIDO and Rotherham Youth Enterprise, the Kickstart Fund supports people looking to establish a business in the local area. Keith Williams, from UKSE, said: "Victoria and Rebecca have shown real entrepreneurial spirit, they're both very passionate about what they do and this shines through with the quality of services they provide to a growing client base. "With any new business, it's important to get the basics right and it's great to see that our funding has helped Beautan start trading, market themselves in the area and fuel initial growth."